The causes and consequences of terrorism are matters of considerable debate and great interest. Spectacular events are recognized by their dates, including the 9/11 attacks in New York and Washington and the 7/7 London bombings. Many other attacks, including those in non-Western countries, receive far less attention even though they may be more frequent and cumulatively cause more casualties. 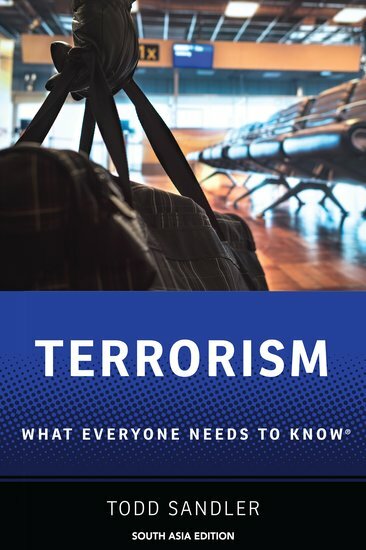 In Terrorism: What Everyone Needs to KnowRG, leading economist Todd Sandler provides a broad overview of a persistently topical topic. The general issues he examines include what terrorism is, its causes, the roles of terrorist groups, how governments seek to counter terrorism, its economic consequences, and the future of terrorism. He focuses on the modern era and how specific motivations, ranging from nationalism/separatism to left- or right-wing extremism or religious ideals, and general conditions, such as poverty and inequality or whether a country is democratic or authoritarian, affect the frequency and costs of terrorism. The diversity of terrorist groups and type of attacks can be overwhelming, and Sandler provides a unifying framework to generate insight: strategic interaction. That is, like other organizations, terrorist groups organize to pursue goals and respond in an optimal fashion to a risky environment that can influence the group's size, its diversity of attacks, its regional location, its host country's characteristics, and the group's ideology. Terrorists also responded to enhanced security measures by altering their tactics, targets, and location. As such, they are formidable opponents to their stronger government adversaries. Governments, in turn, pursue various costly strategies to prevent terrorism, including passive barriers and active attacks against terrorists, their resources, and those who support them. Terrorism covers numerous questions on the subject and sheds lights on a wide-range of theoretical and empirical research.